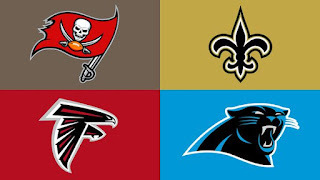 The NFC South could be the only division to have all four teams finish with at least 8 wins. The Atlanta Falcons should win the division, while trying to get back to the Super Bowl while the Carolina Panthers and Tampa Bay Buccaneers fight for one, if not both, wild card spots. The New Orleans Saints are not exactly a playoff caliber team, but they could spoil things inside the division. Atlanta has won the last three games against Carolina and four of their last 6 meetings. They are also 4-2 against New Orleans in some shootouts, with the last six games averaging 58.5 points! The Bucs have won three of the last 4 meetings with the Falcons but split their six since 2014. After losing 6 in a row to the Panthers, Tampa swept Carolina last year. They have just two wins against the New Orleans Saints since 2011, including a 16-11 win last year. Carolina is 4-2 vs New Orleans since the 2014 season. The Falcons will play the Patriots in week 7 to begin a three game road trip. They will also head to Seattle. Carolina's road schedule is set up nicely for traveling. After spending week 1 in San Francisco, they do not travel West, past Chicago/Detroit, the rest of the year. However, they also will play the Patriots in New England. The Bucs have some tough road games in Minnesota, Arizona and Green Bay. They get the Packers at the end of a three game road trip, thanks to their game at Miami being moved from week 1 to week 11. New Orleans does not have back-to-back road games after week 4, which is followed by their bye week. Atlanta will host Green Bay (week 2) and Dallas (week 10). The Panthers get three straight at home weeks 14-16. Tampa host New York and New England in weeks 4 & 5. The Saints host the Patriots, Lions, Bears & Redskins.